The 1950s were a golden-age for American cars. The build-out of highways and birth of the Interstate network later in the decade opened the nation to automobile travel and an expanding post-World War Two economy spurred a boom in automobile sales. Greater affluence resulted in a corresponding desire for luxury and, as the nation’s premier luxury automaker, Cadillac and its legendary designer Harley Earl responded. The introduction of their Eldorado model in 1953 set a new high-water mark for upscale vehicle production and they didn’t stop there. The Eldorado Brougham for 1957 helped maintain their Standard of the World status and the 1959 Cadillac lineup stretched the brand to new lengths, literally. The Fabulous Fifties also saw the height of the tail fin era. 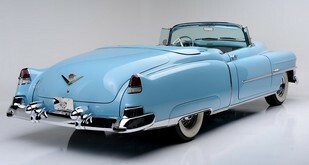 It was Cadillac that introduced the tail fin on its 1948 models. Inspired by the tail section of the U.S. Army’s P-38 Lightning fighter-bomber, no one was able to foresee how this innovative design would shape auto manufacturing well into the 1960s. The tail fin’s popularity grew slowly. But, as consumers showed greater interest the auto manufacturers took notice and a competitive frenzy developed between designers of rival companies. Each new model year saw not only larger fins but more elaborate designs. Chrysler and Virgil Exner went head-on with the Cadillac design team with other General Motors and Ford/Lincoln makes joining the fray. The result was an era of the American automobile that continues to captivate classic car fans sixty years later. For 1959, Cadillac’s Eldorado (its top of the line model) was the pinnacle of luxury. With tri-power carbs feeding its 345 h.p. engine, Eldorado drivers traveled in style riding on an opulent leather upholstery with hundreds of pounds of gleaming chrome drawing the attention of onlookers as the car passed by. Its most noticeable feature however was the set of sharp, towering tail fins with their red bullet-like tail lights. 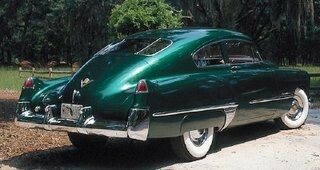 The audacious styling was the talk of the automobile world and not without its controversy and detractors. Elsa Mauer Nicodemus is the President of Cadillac Parts & Restoration (CPR) in Poughkeepsie, NY and her team of Cadillac restoration technicians has produced some of the world’s finest examples of restored Cadillacs including dozens of 1959 Cadillacs. With only 1,320 Eldorado Biarritz (convertible Eldorado) models produced in 1959, it’s thought that only between 300 and 400 remain intact. It’s that rarity that not only makes for a highly collectible vehicle but also an expensive classic car to restore. The scarcity of many parts and condition of whatever remaining barn/field finds still survive make restoration not for the faint of heart. While nice examples of a 1959 Cadillac Eldorado Biarritz can command over $150,000 at auction, restoration expenses can rival that figure. 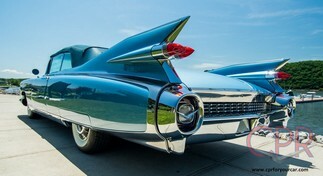 The controversy created by the 1959 Cadillac tail fin ultimately led to the downsizing and demise of the design feature. That model year also saw the end of Harley Earl’s long and distinguished career with General Motors. The next year saw more modestly crafted fins throughout the industry and, by the mid-sixties, the historic tail fin era came to an end. Although the days of such bold styling are long gone, the 1959 Cadillac has been immortalized in American culture. Elvis Presley and Marilyn Monroe are among the national icons who’ve owned one and a short list of the many Hollywood productions that featured the car include 3,000 Miles to Graceland, The Deer Hunter, Ghostbuster, Sin City and Pink Cadillac starring Clint Eastwood. The automobile will always be a treasured element of Americana and the 1959 Cadillac endures as a part of our nation’s rich history. Those interested in learning more about Cadillacs and their history should visit the Cadillac and LaSalle Club’s website. Hank Miller doesn’t own a 1959 Cadillac, or any classic car for that matter. He does, however, specialize in marketing and promoting up and coming automotive-related firms.